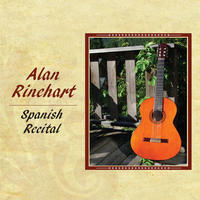 Alan Rinehart : Spanish Recital. A feast of renaissance and baroque music. One of the first things that a concert guitarist considers when contemplating making a recording is doing a 'recital' program. I have avoided this temptation for some time, preferring to create recordings that follow some sort of theme. A well planned concert program will also have certain 'themes' often following a chronological order, including established and well known repertoire as well as new works, perhaps even premiere performances, and be designed to carry the listener on something of a musical journey. This program is based on the music presented in a pair of recitals at The University of British Columbia in Kelowna, B.C. held in the 2012-2013 academic year. The music of Aragonese guitarist Gaspar Sanz (1640-1710) has an immediate melodic appeal. Originally for a 5 course baroque guitar, his music adapts very well to translation to the modern concert guitar. Villanos (village dance), Espanioleta and Canarios (dance from the Canary Islands) are from his 1697 method book. Both Luis Milan and Alonso Mudarra left substantial bodies of music for the vihuela, a 16th century Spanish ancestor of the guitar that was tuned like a lute. Fantasia 12 and Pavana 2 are from Milan's huge 1536 volume El Maestro. Mudarra's three books of music include music for the four course guitar and six course vihuela. Fantasia 18 foreshadows a baroque fugue with well developed counterpoint based on the four note motive G-F#-D#-E.
Santiago de Murcia was active in the first half of the 18th century. Little is known of his life apart from his having a respected career that may have even included time spent in Mexico. His music shows a considerable skill with styles popular at the time. He played a 5 course baroque guitar. Fernando Sor (1778-1839) and Dionisio Aguado (1784-1849) were pioneers in the development of the modern guitar with six single strings. They were both students of Padre Basilio, a legendary guitarist and instructor in Spain, and they both enjoyed active careers as performers, composers and teachers throughout Europe. The varied fandango is reminiscent of a famous fandango by Boccherini. The popular tune/chord progression 'las Folias de España' was often used as a subject for variations. Few composers produced music more closely associated with the guitar than Isaac Albeniz (1860-1909), a curious fact considering he never wrote for the instrument. His Asturias-Leyenda, the Prelude of his great piano work Chants d'Espagne (Songs of Spain), is one of the great staples of the guitar repertoire. His lesser known Pavana-Capriccio is full of considerable charm. The strong association of Flamenco music with Spanish culture overshadows the rich repertoire of very romantic but still distinctly Hispanic music that flourished in the late 1800's. Isaac Albeniz and Enrique Granados were the most famous exponents of this nationalistic style but there were many others, guitarists included. The music of Spanish guitarist-composers enjoyed great popular acclaim at the end of the nineteenth Century. By mixing folkloric elements from the native Flamenco tradition with the classical forms, they created a synthesis of style and playing technique that has persisted in the concert music of the guitar for the last hundred years. Francisco Tarrega was undoubtedly the most influential of these. His Prelude is subtitled 'A Vision from the Devil's Tower'. Jose Broca was a well-known guitarist at the time whose popularity waned as musical fashion changed. Pensamiento Español is a wonderful example of his delicate and appealing style. Another of Tarrega's contributions to the concert repertoire was the arrangement of the music of his contemporaries. His transcription of Joaquin Malats' Serenata Española was dedicated to Tarrega's friend Dr. Walter Leckie. Arguably the most often studied and performed original guitar work, Recuerdos de la Alhambra memorably reflects the fountains of the Alhambra palace in Granada. Tarrega (1852-1909) is often seen as the father of the modern concert guitar technique, this may not entirely be the case but his skill as a performer, composer and arranger built a legacy that provided a firm foundation for the young Andres Segovia. 크레이지슬롯 사이트License A feast of renaissance and baroque music by Alan Rinehart for your project. Play the music of Alan Rinehart in your restaurant or store.